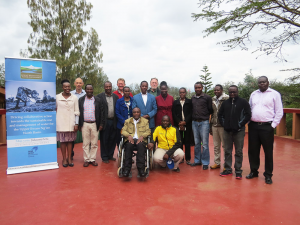 The Mount Kenya Ewaso Water Partnership (MKEWP)–an initiative facilitated by 2030 WRG and supported by the Laikipia Wildlife Forum (LWF)–has been supporting Water Resource User Associations (WRUAs) in Kenya to manage their shared water resources. 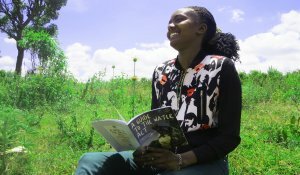 We interviewed Joy Makena, Manager of the Teleswani WRUA in Meru County, Kenya, about her experience leading her community from water conflict to collective action. Joy Makena grew up in a farming family in Meru County, Kenya. On their family plot, her parents grew beans, maize, potatoes, and wheat. Having sufficient water for their crops was never a worry because her parents’ farm sat in the Upper Ewaso Ng’iro North Basin, which received an abundance of water from the glaciers on Mount Kenya. “During those days, the river was full. Villagers who needed to cross the river did so on bridges,” recalls Joy. Today, villagers simply wade across the river. The receding river presents a host of problems. Each dry season, the river is reduced to a mere stream. As the number of people and animals competing for scarce water resources grows, so do tensions within the community. When pastoralists downstream struggle to find water for their cattle, they move upstream in search of increasingly scarce grazing land and water. The upward-bound cattle pass through private property, destroying crops and livelihoods. Meanwhile, smallholder farmers located downstream, believing that smallholder farmers upstream have unfairly diverted water for their crops, destroy those farmers’ irrigation canals and crops in retaliation. The conflicts that ensue sometimes result in deadly violence. Joy was deeply troubled by such conflicts in her community. “I wanted to understand my community’s problems, from my community’s perspective. I wanted to be part of the solution,” says Joy. She believed that community problems can only be resolved by community-led solutions and decided to join her local water resource user association (WRUA). In Kenya, WRUAs are voluntary associations of water users legally mandated to collectively manage common water resources. They function as a kind of localized extension to the national Water Resources Authority (WRA). They are responsible for supplying people within their catchment with sufficient quantity of good quality water, especially during dry spells. This is a gargantuan task, but that is not all. WRUAs are also charged with conserving and protecting the water catchment, preserving riverine forests and the riparian ecosystem, preventing pollution of the rivers, and establishing and enforcing water-use rules. Despite this long list of responsibilities, WRUAs suffer from chronic underfunding. Joy’s WRUA, for example, is financed exclusively by money raised through community water projects; this amount is only a fraction of what is needed. As a result, Joy’s WRUA, like many other WRUAs, are often unable to effectively monitor and regulate water usage or enforce regulations. The Mount Kenya Ewaso Water Partnership (MKEWP)–an initiative facilitated by 2030 WRG and supported by the Laikipia Wildlife Forum (LWF)–has been working with WRUAs like Joy’s since 2016 to build their capacity and facilitate interactions between the community and government agencies. Among many other things, MKEWP supports WRUA members to collectively inventory water-use and advocate for water management priorities within the five-year plans outlining county development goals that inform the national budgeting process. They also monitor water-use, identify illegal water abstraction in the river basin, and facilitate conflict resolution. In March 2013, two months into her new position as her WRUA’s manager, Joy visited a group of farmers as part of a water-monitoring initiative. Thinking that Joy and her colleagues were there to take away their land, the group of farmers chased after Joy and her colleagues with their machetes. In the minds of many smallholder farmers, water and land go hand in hand. To them, any effort to curb their water use was equivalent to a threat on their land ownership. That day, Joy discovered the full extent of misinformation and distrust in the community that she would have to overcome as the manager of her WRUA. Joy began visiting members in the community and listening to their stories. She encouraged them, even those who were hostile to her, to participate in WRUA meetings where they could openly and safely voice their concerns and learn about how they can better manage their shared water resources. In 2017, the Upper Ewaso Ng’iro North Basin experienced an unusually long dry spell. The traditional rationing program—which called for the basin to be divided into two zones, with each zone having access to water on a two-day rotation basis—was not working. A group of people from the community stormed into Joy’s office, demanding for their share of the river’s water. “I was so scared, but I knew that I must reassure them that the WRUA will come up with a plan to ensure sufficient water supply for everyone,” Joy recalled. The plan to institute a two-day non-abstraction period was a success. For the remaining period of that dry spell, everyone received the amount of water they needed and no one in the community had turned against each other. “I cannot even begin to describe the joy I felt. I have managed to do something for my community,” Joy recounts. Joy’s hard work and courage are continuing to pay off. People in the community are showing up at WRUA meetings and are becoming savvy about water resources management. Having a space to air their grievances and listen to their neighbors’ worries enabled groups in the community to build trust and empathy and work together to solve their common water challenges. Together, members of the WRUA have already come up with a number of new community projects to better manage their shared water resources. As far as Joy knows, there have been no new conflicts. But Joy believes that there are more opportunities to make her community more secure and peaceful. She would like to see the WRUA come up with more projects, particularly projects that can help farmers store water for use during the dry seasons. She hopes that the WRUA will become self-sustaining, and wants to get more elderly people, women, and youth interested and involved in managing their community’s water. But Joy has another aspiration for the WRUA—she wants to see more women in leadership positions. “Women are key to better water management. They fetch water for their families, they farm, they cook, and they clean. They understand firsthand the importance of water for the wellbeing of their families, and they have tremendous power to create lasting change,” says Joy. She is already seeing more interest from women in the community and is confident that they will rise to the challenges that stand in the way water security in their community. To take Joy one step closer to her aspirations for her WRUA, MKEWP is in the process of piloting a Water Resource User Association (WRUA) Agency model as a mechanism to effectively finance and capacitate WRUAs to work together with WRA, serving as agents on the ground to ensure equitable and effective management of water resources at the basin level. Dar Es Salaam, Tanzania – The Tanzania 2030 Water Resources Group convened senior representatives from Tanzania’s agriculture, finance, and water sectors to chart a path forward to make it easier for the country’s smallholder and emerging farmers to access financing for irrigation technologies. The move aims to improve irrigation efficiency while also expanding the amount of land under irrigation. The consortium, which includes the Financial Sector Deepening Trust (FSDT), National Irrigation Commission (NIrC), Private Agricultural Support Trust (PASS), Rikolto, Tanzania Agricultural Development Bank (TADB), Tanzania Horticulture Association (TAHA), and Tanzania 2030 WRG, is establishing a partnership that leverages their combined networks to link smallholder farmers with appropriate financing for irrigation investments. 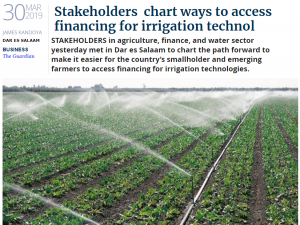 In its first phase, the consortium plans to unlock a portfolio of irrigation projects by enhancing existing financing options that remain out of reach for most smallholder farmers or enabling new financing options entirely. Once at scale, the initiative will see a substantial increase in smallholder farmer’s access to irrigation solutions. Smallholder and emerging farmers account for over 80 percent of the nation’s agriculturalists and they struggle to access credit and loan mechanisms that would enable them to purchase modern, water-efficient irrigation systems. As a result, although Tanzania is endowed with nearly 30 million hectares of irrigable land, less than 500,000 hectares is currently under irrigation, equivalent to less than 2 percent of the potential. Despite the limited amount of land under irrigation, the agriculture sector remains the country’s largest water user, accounting for over 80 percent of water consumed nationally. Gravity, open canal and flooding or basin irrigation methods commonly in use are very water-inefficient, with up to 45 percent water losses. Despite a relative abundance of water resources, critical parts of Tanzania, the Pangani River Basin in particular, are considered water-stressed. Freshwater availability per capita in the latter is 1,200 cubic meters, compared to 1,608 cubic meters for Tanzania as a whole. The water-efficiency of irrigation solutions is therefore critical to safeguard Tanzania’s future water security. A market study carried out in 2016 by TADB, Tanzania 2030 WRG, and FSDT found that although the country’s banks have developed products aimed at supporting such farmers, the high costs of capital and of identifying investment-ready farmers increases the risks to extending irrigation financing on a large scale. The consortium will identify, prioritize, incubate, and package irrigation financing opportunities that meet the requirements of funding sources, therefore reducing the coordination burden on financiers. By facilitating smallholder and emerging farmers’ access to irrigation finance, the consortium will help to expand the amount of land under irrigation, helping to provide both a safeguard against the worst impacts of climate change while at the same time catalyzing economic growth, improving food security, and safeguarding Tanzania’s future water security. The Financial Sector Deepening Trust (FSDT) was incorporated in Tanzania on 1 July 2004 with an overall aim to develop a deeper financial system that can provide greater access to finance to more Tanzanians. 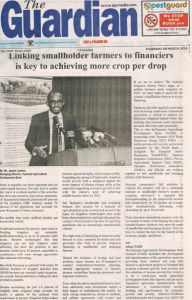 To unlock greater access, volume, and quality of financial services to the agriculture sector and to rural economies in Tanzania, FSDT is addressing constraints to deeper financial sector engagement in the agriculture sector and tackling the issues contributing to high transaction costs for financial services in agricultural and rural markets. The National Irrigation Commission (NIC) is mandated for coordination, promotional and regulatory functions in the development of the irrigation sector in the country. NIC in collaboration with various stakeholders, envisages to improve the traditional irrigation schemes and expand the area under irrigation. It is a semi-autonomous Government Department established under section 3 (1) of the National Irrigation Act No. 5 of 2013, under the Ministry responsible for irrigation. The Private Agricultural Sector Support Trust (PASS) is a facility established in the year 2000 in order to stimulate investment and growth in commercial agriculture and related sectors. It was registered in 2007 as nonprofit making and non-governmental organization under the Trustees Incorporation Act, 2002 and is taxed as charitable organization. Rikolto in East Africa (formerly VECO/Vredeseilanden) is part of the Rikolto Network, an international NGO with more than 40 years’ experience in partnering with farmer organizations and food chain stakeholders across Africa, Asia, Europe and Latin America. Rikolto runs programs in 15 countries worldwide through eight regional offices. We enable and support smallholders’ farmers to take up their role in rural poverty alleviation and to contribute to feeding a growing world population in a sustainable way. The Tanzania Agricultural Development Bank Limited (TADB) facilitates the development and transformation of the agriculture sector by providing short, medium- and long-term finance to agriculture projects in Tanzania that promote economic growth, food security and the reduction of income poverty. Our vision is to be a world-class model agriculture development bank that supports and promotes Tanzania’s agriculture transformation from subsistence to commercialized modern farming and agri-business for economic growth and poverty reduction. TADB was established under the Company Act, 2002 CAP 212 in September 2012. The Tanzania Horticultural Association (TAHA) is an apex private sector member-based organization that advocates for the growth and competitiveness of the horticultural industry in Tanzania. Since its inception in 2004, TAHA has been an effective voicing platform for producers, traders, exporters and processors of the horticultural products mainly; ﬂowers, fruits, vegetables, horticultural seeds, and spices. The Association safeguards the interest of the private sector and ensures the industry issues are well mainstreamed at the national and international agenda. Water is arguably our most important and yet undervalued resource. Not only does it sustain life, but it is a critical enabler of the activities that drive our economy. Agriculture, a mainstay of Tanzanian livelihoods, constitutes 30 percent of the country’s GDP, employs nearly 70 percent of the population, and accounts for over 80 percent of water consumed. Put another way, water and food security are inextricably linked. Traditional methods like gravity, open canal or flooding irrigation are extremely inefficient resulting in up to 45 percent water losses. Modern technologies like drip irrigation can not only improve water efficiency but have the potential to also increase yields up to 50 percent, especially in combination with water storage approaches like rainwater harvesting. But while Tanzania is endowed with nearly 30 million hectares of irrigable land, less than 500,00 hectares are currently under irrigation. As a result, food production is falling far short of what is possible. Despite accounting for just 1.6 percent of irrigable land, irrigated crops account for nearly a quarter of the national food requirement at present. Irrigation helps reduce reliance on increasingly erratic rainfall, protects against droughts, and increases yields. Expanding the amount of land under irrigation would provide both a safeguard against the worst impacts of climate change while at the same time supporting economic growth in line with the nation’s goal of achieving middle-income status by 2025. But Tanzania’s smallholder and emerging farmers, who account for a majority of agriculturalists in the country, lack access to the types of irrigation technologies that could boost their productivity and help safeguard the country’s food security in the face of a growing population and an increasingly unpredictable climate. The high costs of identifying investment-ready farmers is a key constraint for banks and loan providers who want to provide irrigation financing to smallholder and emerging farmers. Despite the existence of savings and loan products, many farmers are ill-equipped to conduct comprehensive business planning, identify appropriate sources of finance, prepare compelling financing proposals, and negotiate loan terms. Even when the above-mentioned barriers have been addressed, such investments require a high degree of confidence in the market. As such, strong cooperatives, access to markets, and offtake agreements with buyers and processors are also needed. If we are to achieve The National Irrigation Master Plan’s target of 1 million hectares under irrigation by 2035, we must make it easier for the country’s smallholder farmers to access financing. Reducing the risks regularly associated with financing small-scale commercial agriculture is critical to achieving our ambitious irrigation targets while also ensuring that precious water resources are used efficiently and sustainably. This is why the Tanzania Agricultural Development Bank (TADB), in partnership with Tanzania 2030 Water Resources Group (2030 WRG) – a public-private-civil society partnership supported by the World Bank – alongside the Financial Sector Deepening Trust (FSDT), National Irrigation Commission (NIrC), Private Agricultural Support Trust (PASS), Tanzania Horticulture Association (TAHA), and Rikolto are working together to link smallholder and emerging farmers with financiers. Once our consortium’s full ambition is realized, the initiative will see a substantial increase in smallholder farmer’s access to irrigation solutions. It is expected that those participating in the project will increase their productivity by 30 percent on average, while simultaneously decreasing water abstraction by up to 50 percent. There has been tremendous progress over the last decade in terms of developing the types of blended-finance solutions that meet the needs of smallholder and emerging farmers. Now it’s time to connect the dots for the benefit of the economy, people, and planet. The Tanzania Agricultural Development Bank Limited (TADB) facilitates the development and transformation of the agriculture sector by providing short, medium and long term finance to agriculture projects in Tanzania that promote economic growth, food security and the reduction of income poverty. Our vision is to be a world-class model agriculture development bank that supports and promotes Tanzania’s agriculture transformation from subsistence to commercialized modern farming and agri-business for economic growth and poverty reduction. TADB was established under the Company Act, 2002 CAP 212 in September 2012. This article was originally published in The Guardian and The Daily News in Tanzania. The 2030 Water Resources Group (2030 WRG) is a public, private, civil society partnership hosted by the World Bank Group. The partnership supports country-level collaboration designed to unite diverse groups with a common interest in the sustainable management of water resources. Our global partners include bilateral agencies and governments (Swiss Development Cooperation, Swedish Development Cooperation, the governments of Hungary and Israel), private companies (Nestlé, PepsiCo, Coca-Cola, Dow Chemical, Ab InBev), development banks (IFC, World Bank, African Development Bank, Inter-American Development Bank), INGOs and IGPs (UNDP, GGGI, GWP, the World Economic Forum, BRAC and IUCN). The 2030 WRG was launched in 2008 at the World Economic Forum and has been hosted by The World Bank Group since 2012. The primary aim of 2030 WRG is to develop partnerships at a national (or state) level that can assist governments to accelerate actions to increase water resources sustainability and water efficiency across the economy. This is based on the recognition that demands for water are increasing dramatically with economic and population growth, and that, assuming a continuation of current trends, the world is predicted to face a 40 percent gap between available renewable water supply and water demand by the year 2030. It is also based on the recognition that the public and private sectors have a common interest in strengthening water resource management and can achieve far more by acting in partnership than alone. 2030 WRG is currently active in Bangladesh, Mongolia, Vietnam, Mexico, Peru, Brazil, Ethiopia, Kenya, South Africa, Tanzania and in India, the program is working in the states of Uttar Pradesh/India National, Maharashtra and Karnataka. 2030 WRG is working to deliver coordinated, multi-stakeholder solutions at scale to promote water security and de-risk livelihoods of farmers in rain-fed areas in Maharashtra, through a combination of programmatic approaches, partnership models, financing mechanisms, and policy interventions. The two key initiatives in this respect include the Maharashtra Cotton Water Platform and market linkages in the cotton-belt. In the industrial and urban sectors, 2030 WRG focuses on policy/governance/tariffs, developing pilots to demonstrate recycling of city sewage and its application in the agriculture sector. The workstream members recently launched the unique Wastewater Reuse Certificates (WRCs) scheme to develop tradable permits for reuse. A Blockchain Hackathon was held recently to crowd-source algorithms to monitor WRCs in a simulated environment. This workstream facilitated the launch of a Project Implementation Unit to assist the development of integrated projects dealing with off-farm, on-farm water conservation efforts in the command area and associated market linkages, aligning with the “More Crop per Drop” policy objectives of the Government of Maharashtra. 2030 WRG is spearheading two cross-cutting initiatives related to Gender- Water – Agriculture and Water Accounting/Budgeting. These two cross-cutting themes are also covered in the multi-stakeholder platform. 2030 WRG recently launched a landmark joint publication with UNDP India titled “Gender and Water in Agriculture and Allied Sectors”. The 2030 WRG Maharashtra State Coordinator will be 2030 WRG’s primary interface and representative for the Maharashtra initiative. The position will serve as a catalyst between public and private sectors and civil society on water and 2030 WRG. The thematic areas of work will include all facets of water in Maharashtra such as resource demand management, policies, projects, programs, and financing mechanisms. This assignment requires extensive experience and engagement with government officials to develop and monitor the program of the 2030 WRG Partnerships. This position will focus on leading the 2030 WRG activities associated with Maharashtra water resources management and report to the India Country Coordinator, Asia Regional Coordinator as well as the Global Program Manager for 2030 WRG. In addition to the responsibilities related to Maharashtra initiative, the position involves substantial knowledge-sharing and synergizing of initiatives in other states in India where 2030 WRG is operating. Specifically, this position requires the pro-active development of linkages between water and other sectors, such as agriculture and urban/industrial sectors. Interested candidates should submit a cover letter, CV, and list of at least three references to aradhakrishnan3@worldbank.org no later than Friday, April 5, 2019. Kindly use the subject line “2030 WRG Maharashtra State Coordinator”. The 2030 WRG Maharashtra State Partnerships Coordinator will support 2030 WRG’s activities in Maharashtra. This position will provide substantive support to the team responsible for implementing activities under the Maharashtra Water MSP (MWMSP), spearheaded by the India Country Coordinator and Maharashtra State Coordinator for 2030 WRG. The subjects of work will include all facets of water in Maharashtra such as resource demand management, policies, projects, programs, and financing mechanisms. This assignment requires extensive experience and engagement with government officials to develop and monitor the 2030 WRG program. This position will facilitate the proper functioning of the MWMSP, support managing stakeholder consultations, assist in organizing events, workshops and outreach activities. The incumbent will report to the Maharashtra State Coordinator and India Country Coordinator, and Asia Regional Coordinator. Kindly use the subject line “2030 WRG Maharashtra State Partnerships Coordinator”. A study by the United Nations’ Food and Agriculture Organization (FAO) reveals that women could improve agricultural yields by 20-30 percent if given access to the same productive resources, such as modern inputs, technology, financial services, and training, that are available to men. In the Amravati district of Maharashtra, 1,900 women from two talukas (administrative divisions of a district) are gradually transforming the agricultural landscape by improving agricultural production and post-harvest processing. Several of the women I recently met in Amravati had interesting stories to share. Through Mahila Arthik Vikas Mahamandal (MAVIM), a government-funded program, women across Maharashtra, including the Amravati district, were encouraged to form Self Help Groups (SHGs) where they could be trained to cultivate a habit of saving and receive access to group credit through bank linkages. In such a way, several women in the district were able to secure loans for their family farms and personal use. MAVIM further encouraged these women to form consortia of SHGs at the taluka level that could support capacity building in areas such as social and leadership skills. As a result, women found the confidence to venture out of their homes, consider possibilities to start their own businesses, and apply for bank loans. The United Nationals Development Programme (UNDP), with the goal of empowering women through Project Disha, trained women in the SHG consortium of two talukas in the Amravati district on post-harvest management, which led to increased income opportunities for them. Through diverse partnerships and support from the private sector which procured produce from these women farmers, these women became knowledgeable about potential business opportunities for them in the agricultural value chain. One of the woman farmers who started their own businesses is Rekha Sarodayay. Rekha is a sourcing manager for one of the SHG consortia from the Wakiraipur village of Amravati. She oversees the sourcing of pigeon peas from three villages, dealing primarily with men; traditionally, such interactions are restricted. In addition to her work as a sourcing manager, Rekha also trains women from the villages in best practices for post-harvest management. Drawing upon the training she has received through various programs, Rekha formed her own small enterprise of making wheat noodles three years ago. Along the way, Rekha had to overcome many difficulties, including getting access to finance to buy the machine she needs to make noodles. She borrowed Rs.25000 (US$370) from her SHG at an annual interest rate of 24 percent and invested her savings to start her business. With access to productive resources, Rekha built a thriving business in less than two years and was able to return the funds she borrowed while contributing to the household income. Today, there are over 150 small businesses owned by women like Rekha in the two talukas. These women, who manage complex households while pursuing multiple livelihood options, continue to inspire confidence in other women of the district. In support of women farmers like Rekha, Reema Sathe left her comfortable corporate job to build a women-friendly supply chain, offering new markets to 15,000 women smallholder farmers. Her team supports a women-run cooperative factory by training them to make baking products using less water-intensive grains like barley, buckwheat, and oats. Through her online platform, Happy Roots, these women were able to sell directly to consumers, thereby eliminating the costs that comes with using middlemen. Women entrepreneurs like Rekha and Reema, are leading some of the most exciting agri-innovations on the ground, and they are a source of inspiration for those who are passionate about empowering women in rural areas. Today, organizations are keen to invest in women with the aim to close to gender gap, improve rural livelihoods and income, and make rural families and communities more food secure. To highlight such examples, 2030 WRG worked with UNDP India on a compendium of case studies from Maharashtra that exemplify women-centric partnership models that have positively impacted agricultural value chains and have the potential to scale. By challenging gender stereotypes, these case studies could catalyze transformative change in the role of women in Maharashtra and beyond. 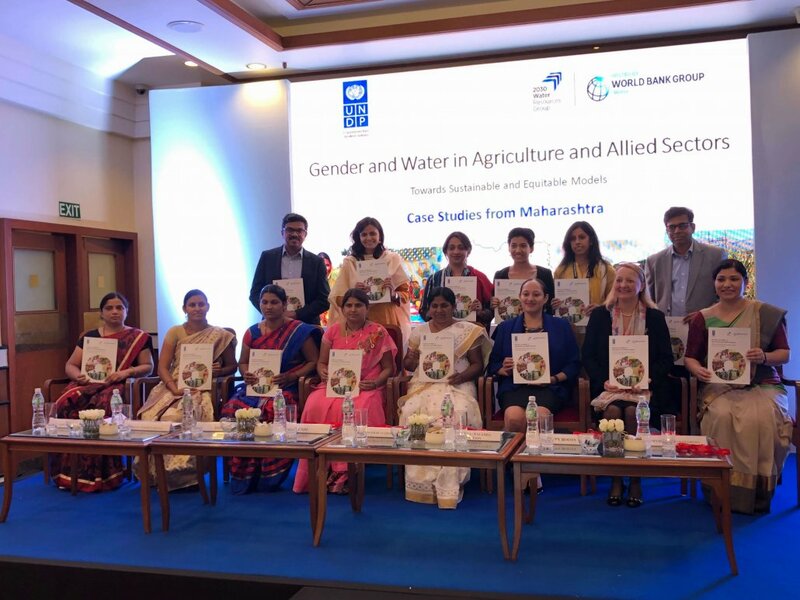 The publication, ‘Gender and Water in Agriculture and Allied Sectors’ was jointly developed by 2030 WRG and UNDP India and was launched on 26 February 2019. Read or download the publication here. For more information, contact Karishma Gupte, kgupte@worldbank.org. 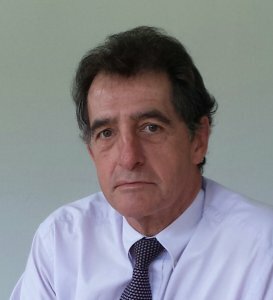 Richard Fox is the Sustainability Director for Flamingo Horticulture and member of the Kenya 2030 WRG Governing Board. He serves as the immediate past Chairman of the Kenya Flower Council, the Chairman of Lake Naivasha Growers Group, and a trustee of Imarisha Naivasha, a pioneering multi-stakeholder forum set up by the Kenyan government to oversee a coordinated landscape approach to long term sustainable development in the Naivasha basin, the hub of Kenya’s floriculture industry. This past April, he was elected as President of Union Fleurs, the international flower trade association after a four-year tenure as Vice-President. Following Richard’s participation in the 2030 WRG Webinar Series event focused on Kenya – you can access the recording here – we sat down with Richard to explore in more depth some of the topics he touched upon during the webinar. Kenya 2030 WRG: What is your assessment of public-private-civil society collaboration in Kenya? How has it evolved since you started working in this space? RF: The framework for public-private-people collaboration is well established in Kenya, however this is a relatively recent development. The constitution promulgated in 2010 requires community-wide participation in the formulation of development opportunities and strategies, and the government has been active in encouraging the private sector to partner with them to deliver opportunities for national development. One area where this collaboration is not only very prevalent but has proven to be extremely successful is river basin management. Here, public-private-partnership (PPP) models have recorded significant successes in the last 10 years. I believe that this is in part because river basins are a defined area where stakeholders who rely on water resources – public, private and people – have an interest in how these resources are managed to ensure reliability of supply and long term sustainability. Looking ahead there is a need – and an opportunity – to evolve and adapt these models to other sectors. Kenya 2030 WRG: What do you see as the biggest challenges facing sustainable water management in Kenya at the moment? In Kenya we have comprehensive water laws but enforcement is weak. As a consequence, decisions around water allocation and permit renewals lack transparency and without this the private sector is reluctant to embrace PPP partnerships. There is an historical mindset that water management is solely a government responsibility, which translates into a reluctance on the part of both the public and private sectors to engage in more collaborative structures. A lack of transparency, meanwhile, creates uncertainty for business, and encourages businesses to be inward looking that is antithetical to collaborative and sustainable resource management. This is among the biggest challenges we currently face in Kenya, but one where multi-stakeholder coordination can bring much added value by improving transparency and accountability. Kenya 2030 WRG: In your experience, what incentives are most effective to encourage participation and investment in sustainable water management in the private sector? RF: For the private sector, sustainable water management has two components. The first is inside the fence where a user can improve its efficiencies in water use and disposal, and which offers a direct cost saving opportunity. The second is outside the fence, where the water-user needs to understand the impact of its activities on water availability to other stakeholders and to the security of the supply. There is no reason why this cannot be replicable in other industries and water catchment areas. Kenya 2030 WRG: What opportunities exist for private sector actors? How can Kenya 2030 WRG best support the private sector to leverage these opportunities? It is important for government to recognize the success already achieved in the multi-stakeholder platforms that have been set up, and to continue to support them financially. The participation of the private sector in existing alliances and partnership organizations is evidence that business sees the value of them. These structures are replicable and adaptable to other catchments. Kenya 2030 WRG is in a position to champion the engagement of the private sector as part of its focus on reducing the deficit of water availability predicted in 2030. Accurate evaluation of water risks and transparency in resource management has the potential to maximize the opportunities for industrial and agricultural development in the country, create employment for Kenya’s young people and rehabilitate and protect our environment, safeguarding its productive capacity for future generations. And that is always good business! 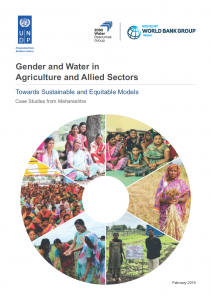 February 26, 2019, Mumbai, India – Today the publication ‘Gender and Water in Agriculture and Allied Sectors’ was launched, developed jointly by 2030 Water Resources Group, a public -private-civil society partnership hosted by the World Bank Group, and the United Nations Development Programme, India. The publication showcases five successful case studies of women-led growth and entrepreneurship through their participation in agricultural production systems and allied sectors, supported by the collaboration and intervention of public and private sector, and civil society organizations. Agriculture in India continues to be at the mercy of unpredictable weather patterns and acute shortage of sustainable water resources. In addition, the existing gender gap prevents women from effectively contributing to improved agricultural productivity. These case studies, at the intersection of water, gender and agriculture, are closely aligned with eight 2030 Sustainable Development Goals (SDGs) of the United Nations. Project Disha, a partnership between UNDP India and India Development Foundation, supported by IKEA Foundation, demonstrates a successful public and private sector collaboration. Under the pilot in Vidarbha, UNDP India collaborated with Future Group to train 30 women from Mahila Arthik Vikas Mahamandal’s (MAVIM) Self-Help Groups (SHGs) in areas such as procurement management, grading, market analysis, buying and pricing strategies, storage basics, and soft skills and communication. These 30 women, known as Women Sourcing Managers (WSMs), trained women farmers across the west Vidharbha region, creating a baseline of 5600 women farmers, who are now breaking gender stereotypes by taking a leading role in agriculture practices, with activities such as goat-rearing, poultry farming, dal mills production, etc., availing internal loans from their savings groups and generating household income. “These are stories of empowerment, of courage and strength to improve the community and the village, and of dynamic and enterprising women who are contributing to their household income. The demonstration projects highlighted in this report have beneﬁted 50,000 women so far, offering numerous policy directions to reach scale” said Ms. Karin Krchnak, 2030 WRG Program Manager, World Bank Group. Swedish Development Cooperation, the governments of Hungary and Israel), private companies (Nestlé, PepsiCo, Coca-Cola, Dow Chemical, Ab InBev), development banks (IFC, World Bank, African Development Bank, Inter-American Development Bank), INGOs and IGPs (UNDP, GGGI, GWP, the World Economic Forum, BRAC and IUCN). The 2030 WRG was launched in 2008 at the World Economic Forum and has been hosted by The World Bank Group since 2012. South Africa’s Strategic Water Partners Network (SWPN) has appointed Ms. Thembi Mkhize as the new Program Manager. She assumed her duties as of February 4th, 2019. The SWPN is a multi-stakeholder platform, brokered by the 2030 Water Resources Group (WRG), chaired by the Department of Water and Sanitation (DWS), and co-chaired by South African Breweries (SAB) on behalf of business, working collectively for the country’s water security. 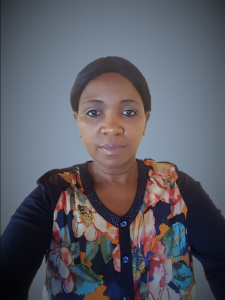 Ms. Mkhize has 20 years’ cross-disciplinary experience in the water sector, with a special focus on water loss initiatives, non-revenue water and public-private partnerships. She served as the Chief Director of Water and Sanitation for the Emfuleni Provincial Municipality from 2010 to 2015, where she managed a team of 340 personnel across six departments. Under her leadership, the municipality initiated the award-winning Boloka Metsi initiative – “Save Water” in Sotho. The pioneering PPP between the Emfuleni Municipality, GIZ, and Sasol, successfully reduced demand for water in the municipality by 6.8 million m3 in just two years, earning a National Conservation Award in 2013. Prior to joining SWPN, Thembi headed the Marketing Department for L-RAM Civil and Construction Company, where she led the company’s marketing and business development efforts, successfully coordinating over R18 million (USD $1.4 million) in project funding in less than two years. “I am thrilled to be joining such an innovative initiative” said Thembi. She believes that the unique position occupied by the SWPN in the water space is critically important: testing and scaling innovations that accelerate water use efficiency and wastewater treatment and reuse across the country’s most important economic sectors, from mining, to agricultural, to municipal water. “The challenges we face can’t be solved by any entity on its own. How we work together, the process of balancing competing priorities and demand on our nation’s water resources, will be critical to securing South Africa’s future water security” she said. Thembi holds a BSc Honours in Water Utilization & Engineering from Pretoria University, as well as a certificate in Environmental Law Specialising in Water & Environment Management Laws from the University of North West, and an Ecotox Specialising in Water, Effluent & Chemical Product Toxicity from Rhodes University.